I'm honored to be sharing an artwork using a really cool product from ICE Resin and my favorite products from Faber-Castell Design Memory Craft! Here are some of the items I received from ICE Resin... immediately, my mojo was super charged! I couldn't wait to try it all! I have never used ICE Resin before so I had no idea how to begin. I went looking for online tutorials to get me started! ICE Resin has some great demo tuts on their website and I found a few from their designers too! So, with some ideas from the tutorials, I started mixing up some resin. I let it sit for a few minutes while I prepped a stamp with some Gelatos®colors in Margarita Mix, Snow Cone, and Metallic Mint. 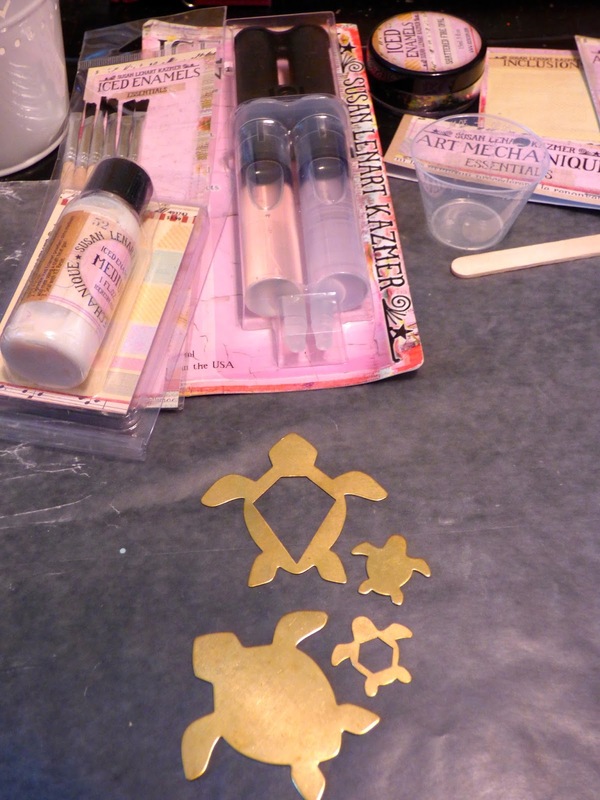 I also used a mold I had and got a few papers to try some Resin paper with the left over. I poured the ICE resin on the stamp so that a puddle formed and left it to set. I poured a bit more into my butterfly mold and sprinkled some Opal Fire inclusions into the wet resin. This stuff is GORGEOUS! With the left over resin, I brushed it onto the papers. 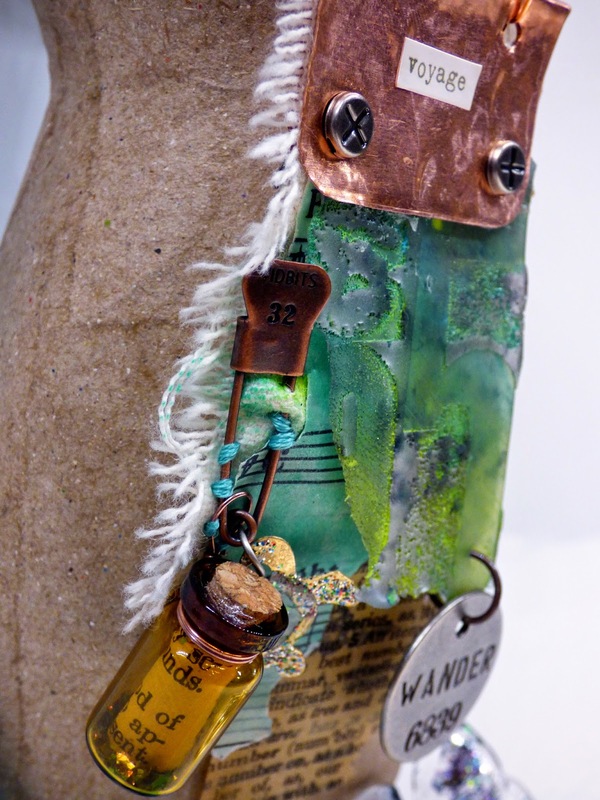 This mixed media pendant necklace was so fun to make! I had some scrap fabric, metal pieces, and wire to create a fun piece that would be special to wear or to display. Here is a close up of the resin papers. I colored them with Gelatos®colors too and then brushed the resin on and allowed it to set. The papers are flexible and translucent. This is a technique I'm going to try again and make some other items with them! The ICE Resin came right off the stamp with the Gelatos® coloring the transparent resin just by pouring it over the rubber stamp! It is so cool! I cut it with scissors and could punch through the resin to attach to the metal and jump ring. 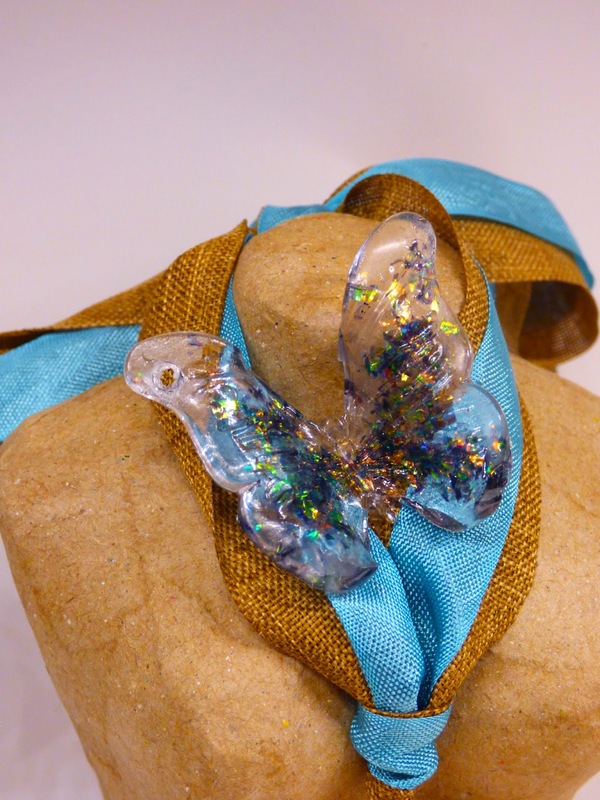 Here is a view of the resin butterfly. I just set it there but may use it in another piece later. I used some ribbon for the necklace part. You can see the little turtle charm that I embossed and some ICE resin with inclusions and a word sticker that says "Joy". I hope you enjoyed my project for the blog hop... check out the other designers projects throughout the week by following the links below! 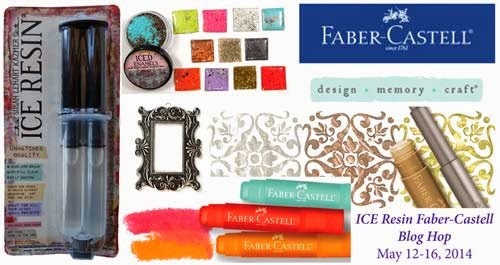 Want chances to win a Designing with Gelatos Kit or an ICE Resin Kit? The blog hop projects will end on Friday but you have until midnight Eastern time on Sunday, May 18 to post a comment. Winners will be announced Monday, May 19th. Two winners will win a Designing with Gelatos kit OR a prize pack from Ice Resin (a Resin Plunger, a Bezel, Medium and a Relique). That's a fun project. I like the details. Exciting necklace & butterfly Jen!!! 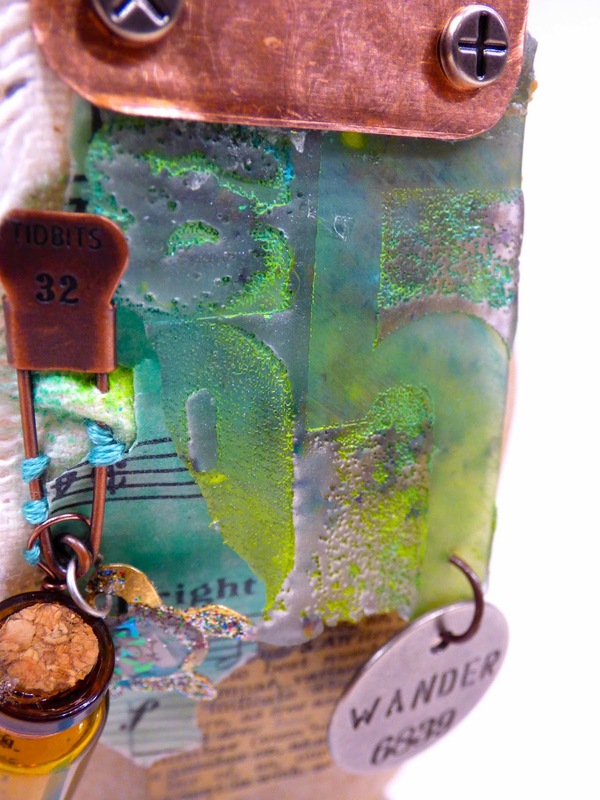 I LOVE the effect of using the Ice Resin over the Gelatos on your stamp - WOW!!! So creative and clever, gorgeous project!!! Wow, you jumped right in and made so many pretty pieces. The stamp technique is very cool. I am going to have to play with my Ice Resin and make me a necklace. 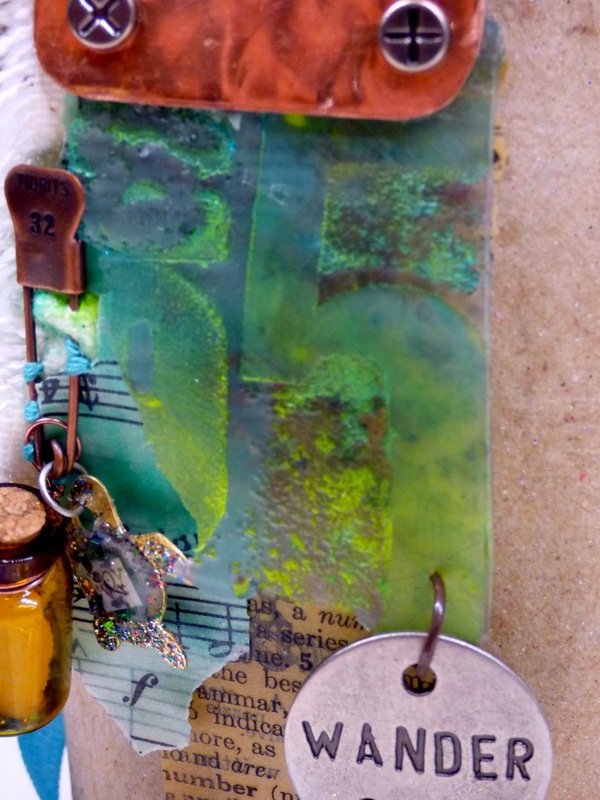 I loved that you used the resin 3 ways...very creative. What a fun piece! I love all the elements! Thanks for sharing! Oh my gosh Oh my gosh Oh my gosh - I need to drop everything and go try this RIGHT NOW... Oh wait, I'm at work..... Awesome techniques! It never would have occurred to me to put the resin on a stamp - I'd have been afraid of ruining the stamp but that came out soooo cool! Beautiful. You will be able to change out the embellishments on the form whenever you get tired of the same thing. thanks for sharing the details. You are so imaginative! I love the whole piece, especially the butterfly. I love all the colorful elements of your pendant! So summery! Cool project! Love the rubberstamp idea!!!! Amazing! This is definitely something I must try! The necklace is beautiful. The ice resin looks like an amazing product that I must have! Wow! That stuff is cool. Would never have guessed this was your first attempt at using Ice resin. You rocked it! You have great ideas! I love that you tried multiple techniques - I have not tried pouring resin on a stamp yet but you've inspired me to try it! Thank you! What a very nice Idea. I love the thought of pouring it on a stamp...will have to add that to the must try list! This is awesome! Such a great idea. Thank you for sharing! Wow! This is a really really awesome piece! I love it! Wow, for not "playing" with ICE before, that is pretty amazing. what a great project. does it ruin the stamp or is it easily cleanable? What a fun pendant necklace, I love all of the details! Thanks for sharing. What a beautiful piece! Lots of wonderful details. TFS! I don't know which one I'd choose if I won, but what a fun choice! Amazing project. Just love it. The butterfly is gorgeous. Love all the media's you used. I love your pendant! Mixing gelatos and Ice Resin is a beautiful combination. The butterfly is so beautiful. What a great idea using the stamp. Always love your work!! 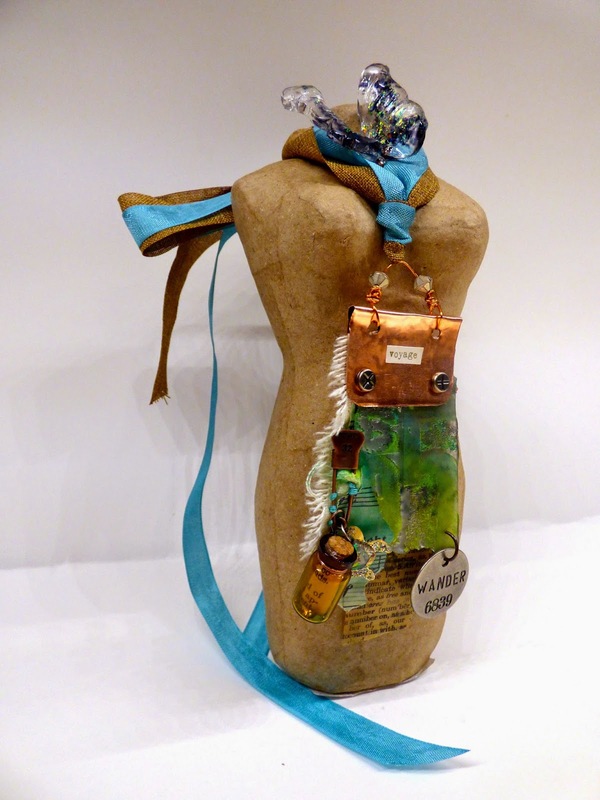 Wonderful necklace with so many ideas incorporated. Love that little turtle. And very cool what you did with the mold and the gelatos. Thanks for sharing. oh GASP - this is stunning. I love this dress form. This new product is interesting. It seems you can do alot with it. I was wondering about an odor? Does it have a strong order like other like products? The butterfly is so cool! TFS! Like the scarf with the butterfly and all the detail. 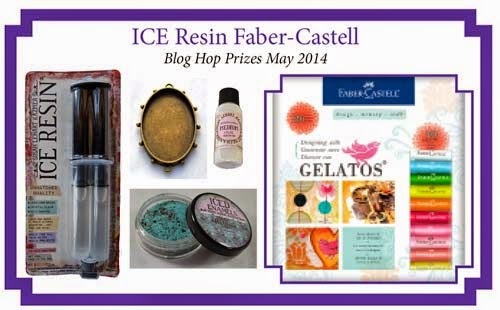 That ice resin is an intriguing product & one I would LOVE to play with! Thanks for sharing!! This looks like fun. I love the pieces you created! I've love a chance to try Ice Resin. Gorgeous project! Thanks for sharing it with us! What a funky cool necklace, love the creativity flowing here! Molds! The butterfly is fab! And gelatoes on the stamp! I am so inspired! Really beautiful projects! Love,love, love the butterfly, super awesome. Thanks for sharing with us. 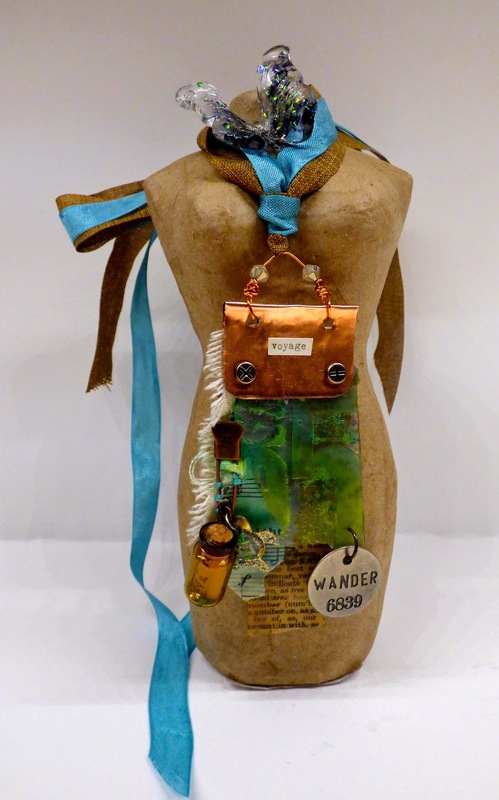 Love the suitcase with the word "wander". Beautiful pieces and finished result. I think my favourite is the ice butterfly with the fire opal, Gorgeous!! Fabulous! The butterfly is superb! The ice resin looks so versatile and fun. I never would have thought to let it pool on top of the stamp. I love it! This makes a nicer piece than when you stamp into the ice resin that you pour on the craft sheet. Love the butterfly too.